Do you want to grow beautiful crops and have a generous yield? Do you want your flowers to grow unbothered by weeds? A rotavator and tiller might be exactly what you need. 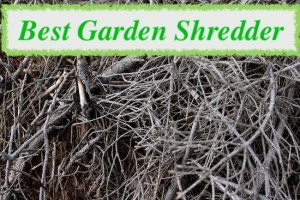 These products serve different purposes, so it’s important to choose one according to your needs and how you plan to prepare your garden. At the end of these reviews you can find our buying guide, we highly recommend taking a look if you’re not in a rush. The Handy ET1400 really does justice to its name because it’s very handy and with plenty of quality characteristics. For instance, it’s light and quiet, which makes it user-friendly and easy to operate. There’s just one caveat: if you have couch grass in your garden, it can get stuck in the space formed between the grass and the central gear housing. Otherwise, it’s a powerful machine, with a 1400 W motor, a 43 cm working width and 20 cm working depth. That makes it ideal to prepare your soil before planting as well as weed control. It does a good job too, working better than a petrol-based machine as there’s no pesky smell and you never run out of fuel. On the other hand, although it can dig even through baked clay in seconds, it tends to bounce a bit first, until it truly digs in. Other than that, this is a very user-friendly product, with a generous 10 m cable and foldable handles that add to its portability and ease of storage. Another handy product from The Handy brand, this petrol-based machine boasts a powerful Briggs & Stratton 450 series engine. This motor has 3.5 HP, helping it achieve some good tilling. As such, it’s one of the best rotavators for allotment or home gardens, with no significant issues. It has one forward gear, and the engine starts fast, on the first or second pull. This solid machinery is also light, which in turn makes it user-friendly and easy to operate. Besides, thanks to the folding handles and compact dimensions, you can easily fold and store it. On the other hand, the transport wheels, albeit handy, are somewhat smaller than ideal to make transportation a breeze. With a 38 cm working width and 25 cm working depth, the Handy Petrol Tiller can perform quite well in vegetable patches. You need a couple of runs in different directions for optimal results, which is why it’s a pity this machine doesn’t feature a reverse drive. This Garden Gear Electric Garden Tiller is one of the best tillers for small gardens, considering it boasts a powerful 1050W motor. Its design makes it user-friendly and multifunctional, thanks to its two separate handles that are easy to grip. These handles are what help you manoeuvre the machine with no effort to speak of and without damaging your patches. There are four tines employed by the motor, which can dig even through hard ground. That helps you prepare your garden or allotment soil to plant new vegetables, ensuring they grow to form a beautiful crop. The only downside is that it doesn’t start up really easily. You can also use this tiller to level an area or to break the soil surface in the borders because it handles various soil types. 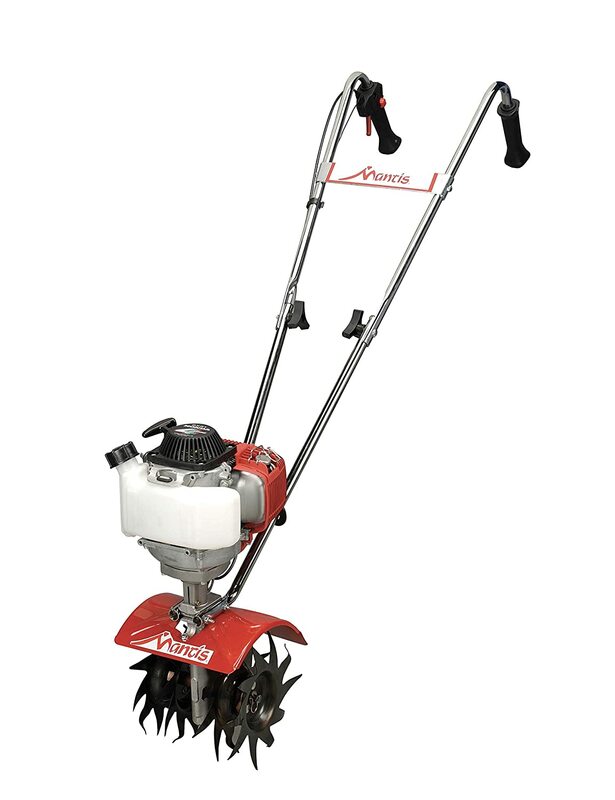 With a 32 cm cutting width, you will be sure to navigate easily through narrow flower beds or vegetable rows. Besides, the maximum depth is 22 cm, so you need to pass more times back and forth to ensure the soil becomes fine and light. Another advantage is its two-point safety switch that ensures there’s no accidental start. This light, affordable machinery also comes with overheat protection, double-insulated metal parts and a cable tidy. Besides, the 10 m power cord is quite generous, and so is the 24-month guarantee. This Mantis Petrol Tiller is one of the best products for clay soil, thanks to its powerful Honda engine with four cycles, 200 RPM and four reversible tines. You can also use it to create new gardens, to till in between raised beds or nearby fences. The only problem is that is can get stuck on roots. The compact design and low weight of this machinery make it easy to use, but it’s a robust and powerful thing. It starts by just one push of a button, but you need to squeeze the throttle to activate the tines, which is a very safe mechanism. The 22 cm width allows you to navigate through narrow rows, while the 5-25 cm depth allows you to dig through hard clay or just break the soil’s surface. The reversible tines allow you to cultivate the soil at a shallow level too, which makes this a versatile machine. The folding handles are good for storing purposes, and the guarantees provided are quite appealing. On the other hand, this is a quite an expensive tiller, even if it’s so small. This eSkde Garden Kit is a reliable product if you want to turn the soil at its most shallow level. Its 20 cm working width means you can squeeze in even through narrow beds, but it also makes this machine best suited for a small garden. The 8 cm max working depth allows you to work only at a shallow level, but the good news is that this product allows you to navigate even through clay. With a 280 rpm motor, you could say that this is a powerful product, especially considering it features multi-legged blades. These blades are particularly sharp, so they’re ideal for tilling the earth, which stops weed and grass from growing. Another advantage is the adjustable soft-grip handles with their ergonomic design. The 18 V lithium rechargeable battery should be fairly resistant. However, depending on how difficult the terrain conditions are, the battery can discharge in up to 15 minutes. The battery charge itself takes several hours, but the good news is that you get a battery and charger included in the package. This following buying guide is shaped according to your purpose and the products’ intended uses. That’s why it’s useful to differentiate between a rotavator, tiller and cultivator, as well as their specific features. Before deciding on a product, it’s wise to know the difference between these machines. 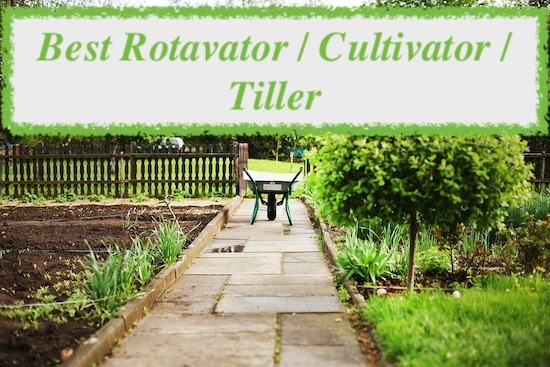 So what is a rotavator, a tiller or a cultivator? The rotavator is the most powerful of the three machines and can work on petrol or electricity. The rule of thumb is that rotavators have rear wheels, but some of the bigger rotavators have their blades up front. Considering they’re so powerful and can dig pretty deep into the ground, over 22 cm, rotavators are great for bigger allotments and soil preparation. Cultivators can be used for mixing loose soil and adding compost or fertiliser. They’re the least powerful from the batch, so they’re not great when it comes to breaking hard soil. You can find them in electric, petrol or cordless models, and their main use is to make the final preparations before actual planting. Garden tillers can both dig and mix hard soil to create loose soil that’s great for garden beds. Tillers can have their tines both in the front or at the rear. Front tine tillers are easy to manoeuvre, and they’re best suited for soft ground and small to medium gardens. Rear tine tillers are larger, heavier and better suited for breaking up hard soil in large gardens. Basically, there is no such thing as the perfect product: garden rotavators are best for some specific purposes, while tillers and cultivators excel at others. Depending on the model you’re choosing, the maximum working width tells you two things about your product: how much space it can cover and how far apart your vegetable beds can be from each other. Obviously, a bigger working width like that sported by rotavators is better for large gardens, but you can’t easily manoeuvre such a machine between narrow beds. Besides, if you want to dig the soil alongside fences, you might consider that a garden tiller is best for this purpose or even a cultivator. The working depth featured by a certain product tells you what you can use it for too. A bigger depth like that of rotavators is better suited for soil preparation and weed control. A medium depth sported by tillers is perfect for creating vegetable rows, while a smaller depth like that of cultivators is great for aerating the soil. As such, you can employ a machine with a smaller maximum depth to dig deeper, but you would have to drive over the same spot a few times, which is time-consuming. On the other hand, some products on the market have an adjustable depth thanks to reversible tines, which makes them versatile. There are some advantages and disadvantages sported by these three models. Cable length is important if you’re getting an electric machine, and it can be particularly confining if it’s too small. Electric-powered devices also add to your electricity bill, but they don’t smell, they’re generally more quiet and eco-friendly. Gas rotavators or tillers are noisier, but they’re cheaper and you never depend on a wall socket nearby. The same goes for cordless products, but the downside is that their batteries last considerably less when compared to gas tillers or rotavators. The handles are quite important when it comes to choosing a garden rotavator, tiller or cultivator. Firstly, soft-grip, ergonomic handles reduce wrist and back pain, making the use exponentially easier. Secondly, if they’re adjustable, they can make the machine comfortable for people of different heights. If they’re also foldable, it can make your machine easier to store. An easy-to-use machine has a user-friendly design and various features, such as low weight, powerful engine and quick starting time. Reverse gears are also useful, considering they add to the multiple functions of your product. On the other hand, ease of use means different things depending on your purpose. A good rotavator for clay, for instance, weighs more, is bigger and has a powerful engine with a few hundred rpm. A cultivator is smaller and lighter, which makes it great for navigating through narrow beds, but nor for covering a large lawn, and certainly not a powerful device. 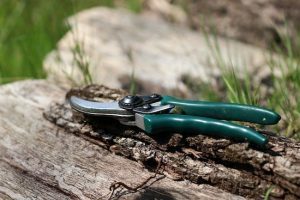 Safety measures are significant because garden tools imply a certain degree of risk. As such, extra insulation to the wiring, a safety mechanism for start-up or overheating protection always show interest in user experience and are features of a quality product. There are all sorts of extras you can get in the package, apart from the instructions manual which should be comprehensive and easy to understand. For instance, if you’re getting a cordless machine, you might get a charger and battery. Oil or petrol-running machines might include some to help you use the machine right out of the box. Carry bags or cleaning supplies are also fairly common. Guarantees show you how reliable and durable a certain product is. They give you confidence in the brand, as well as a timeline for possible replacements. That way guarantees also help you estimate the value received for the money paid. We’ve taken you through various rotavator, tiller and cultivator reviews, so you can compare, contrast and get the right product for your needs. The buying guide hopefully sheds some light on the most important factors that should influence your buying decision. Is there any specific product that you liked the most?